A new book came out last October that I think deserves the attention of NT text critics, especially those working on all things stemmatic. It’s written by Paolo Trovato, a prolific Italian philologist (the same Trovato putting on the summer school). 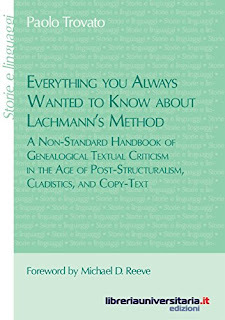 The book is Everything You Always Wanted to Know about Lachmann’s Method: A Non-Standard Handbook of Genealogical Textual Criticism in the Age of Post-Structuralism, Cladistics, and Copy-Text (Padova: libreriauniversitaria.it , 2014). 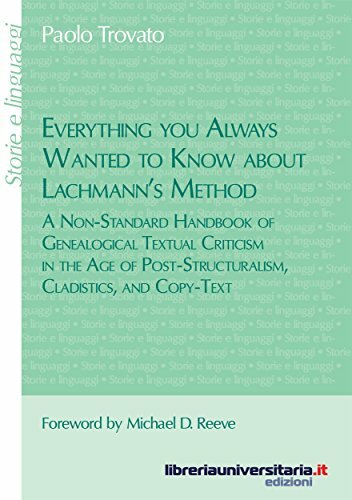 This is now, in my opinion, by far the best book on Lachmannian stemmatics and should supercede Paul Maas as the first place to turn to understand this classic method of textual criticism. Trovato has done English readers a special service by making a point to include translated quotations from Italian textual critics. This is valuable material that is otherwise inaccessible to students who don’t read Italian. (That said, the French is generally untranslated.) This alone made it worth the price for me. Although focused on classical and medieval works (only Paul Wegner’s Student’s Guide and Epp’s article on classification get a mention for Biblical textual criticism), there is much here by way of principle to benefit any textual critic. Written with verve but also with a thorough knowledge of the subject, it should serve beginning students and seasoned scholars admirably. You can read the first 30 pages here. Trovato is traditional in his conception of the goal of TC writing that “this book … addresses a central problem in textual criticism … how to try to correctly reconstruct the text of the past so that, even if not identical, it is as close as possible to the lost original, starting from a number of copies more or less full of mistakes” (p. 13; emphasis original). I did not realize that the metaphor of textual transmission flowing like water goes back at least to Jerome. Trovato comments that “a systematic investigation of the classical philology manuals [for this metaphor] used in the late nineteenth century would undoubtedly yield interesting results” (p. 56). Trovato is far clearer in his explanations of Lachmannianism than I have found Maas to be. I must have read Maas 2-3 times and yet there were several key principles that didn’t “click” until I read Trovato. His book is much longer, but if you want to read Maas, I recommend at least having Trovato by your side to expand on Maas’s well-known brevity. There is a very interesting appendix on the survival rate of early European printed books. The loss rates range between 76% and 100% with most in the range of 80–90%. He says “I do not see valid reasons to imagine that the manuscripts of classical or medieval authors … stood higher chances of survival” (p. 108). In light of some criticisms of the CBGM vis-a-vis history, it’s worth hearing what Trovato says about Lachmannian stemmatics: “Many believe stemmata to be accurate depictions of the historical vicissitudes of transmission, but it is the few who believe that this is not the case who are right” (p. 144). On pp. 174-178 he addressed the criticism that eclectic editions always produce un texte etrangement composite et bigarré (a strangely composite and variegated text) to cite Joseph Bédier. This strikes me as precisely the criticism Maurice Robinson has raised about reasoned eclecticism producing a “test tube” NT text. Someone ought to write an article setting the NT debate between eclectic and documentary approaches in the context of the same debate as it occurs in other textual traditions. Thanks for the pointer to this book. It's probably no surprise to many readers here but I'm in favor of moving to a more stemmatic approach for the textual criticism of the New Testament. It provides one with a hypothesis of both an attainable early text (the archetype) as well as the history (the stemma) in one. I'd be very impressed if one can learn stemmatics just from Maas's book. It's really too condensed for the task. Somewhat more helpful is M. L. West and Timpanaro, now translated into English. The problem with a lot of works on classical textual criticism is that they spend most of their time on conjectural emendation. So, must documentary and eclectic methods be contrasted? It seems to me, as an interested non-scholar, that one reading of Travato would allow for using documentary method to distinguish the most likely variants and then use the eclectic method to distinguish the viable variants. This seems to be, at least in principle, what Comfort claims to do.